Miswiring of neuronal circuits during early life is likely to be a major cause of neurological disorders, including autism and schizophrenia. The Lu lab is interested in how activity-dependent processes during brain development fine-tune the establishment of neural circuits and how sensory experiences affect neural circuit wiring and cognitive behaviors. Specifically, we are interested in exploring the role of the metabotropic glutamate receptor 5 (mGluR5), a group 1 metabotropic glutamate receptor. mGluR5 mutations have been identified in some ADHD and schizophrenic patients. We employ mouse genetic tools to understand the contribution of mGluR5 signaling in specific neuronal populations to sensory circuit formation, synaptic function/plasticity, and behavior. We are also exploring the role of the endogenous cannabinoid (endocannabinoid) system in fetal brain development and investigating how prenatal cannabis exposure affects brain development and later behaviors. Understanding the effects of endocannabinoids during neural circuit formation will not only shed light on normal brain development and function but will also allow us to assess endocannabinoid-based therapies and the effects of cannabis use on the developing fetus. Proper brain function requires an active maintenance program to sustain neuronal health. Environmental stressors detrimentally impact the nervous system, predisposing it to neuronal dysfunction and degeneration if neuroprotective mechanisms are weakened. Recent studies by others and us revealed that NMNAT2 (nicotinamide mononucleotide adenylyl transferase 2) is a neuroprotective protein that is central to maintain neuronal integrity and facilitate proper neural function throughout life. NMNAT2 abundance is significantly reduced in Alzheimer’s Disease (AD) brains. Increasing Nmnat2 expression in neurodegenerative animal models reduced neurodegeneration. We hope to elucidate the mechanisms underlying NMNAT2’s neuroprotection and how NMNAT2 expression is down-regulated in pathological conditions. In addition, we hope to develop NMNAT2-specific therapies to prevent or reduce neurodegeneration. Yousuf O. Ali, Hunter M. Allen, Lei Yu, David Li-Kroeger, Dena Bakhshizadehmahmoudi, Asante Hatcher, Cristin McCabe, Jishu Xu, Nicole Bjorklund, Giulio Taglialatela, David A. Bennett, Philip L. De Jager, Joshua M. Shulman, Hugo J. Bellen, and Hui-Chen Lu (2016) “NMNAT2:HSP90 Complex Mediates Proteostasis in Proteinopathies”, PLOS Biology. Published online June 2 2016, doi:10.1371/journal.pbio.1002472. Baiping Wang, Zilai Wang, Lu Sun, Li Yang, Hongmei li, Allysa Cole, Jennifer Rodriguez-Rivera, Hui-Chen Lu, Hui Zheng (2014) “The Amyloid Precursor Protein Controls Adult Hippocampal Neurogenesis through GABAergic Interneurons”, in press for Journal of Neuroscience. Tabassum Majid, Yousuf O. Ali, Deepa V. Venkitararamani, Ming-Kuei Jang, Hui-Chen Lu, Robia G Pautler (2014) “In vivo axonal transport deficits in a mouse model of fronto-temporal dementia”, Neuroimage: Clinical, 4:711-7. Chia-Shan Wu, Daniel Morgan, Chris P. Jew, Chris Haskins, Mary-Jeanette Andrews, Corinne M. Spencer, Traci Czyzyk, Heather Bradshaw, Ken Mackie, Hui-Chen Lu (2014) “Long-term consequences of perinatal fatty acid amino hydrolase inhibition”, British J. Pharmacology, 171:1420-34. Yousuf O. Ali, David Li-Kroeger, Hugo Bellen, R. Grace Zhai, Hui-Chen Lu (2013) NMNATs, evolutionary conserved neuronal maintenance factors, Trends in Neuroscience, 36:632-40. YanGang Sun, Juan Pita-Almenar, Chia-Shan Wu, John J Renger, Victor N. Uebele, Hui-Chen Lu, Michael Beierlein (2013) Biphasic cholinergic synaptic transmission controls action potential activity in thalamic reticular nucleus neurons, Journal of Neuroscience 33: 2048-59. Chia-Shan Wu, Hongmei Chen, Hao Sun, Jie Zhu, Chris P. Jew, Jim Wager-Miller, Alex Straiker, Corinne Spencer, Heather Bradshaw, Ken Mackie, Hui-Chen Lu (2013) GPR55, a G protein coupled receptor for lysophosphatidylinositol, plays a role in motor coordination, PLoS One. 8:e60314. Chris P. Jew, Chia-Shan Wu, Hao Sun, Jie Zhu, Jui-Yen Huang, Dinghui Yu, Nicholas J. Justice, Hui-Chen Lu (2013) mGluR5 ablation in cortical glutamatergic neurons increases novelty-induced locomotion, PLoS One, 8:e70415. Kihoon Han,J. Lloyd Holder Jr, Christian P. Schaaf, Hui Lu, Hongmei Chen, Hyojin Kang, Jianrong Tang, Zhenyu Wu, Shuang Hao, Sau Wai Cheung, Peng Yu, Hao Sun, Amy M. Breman, Ankita Patel, Hui-Chen Lu, Huda Y. Zoghbi (2013) SHANK3 duplication causes a hyperkinetic neuropsychiatric disorder with unique pharmacogenetic properties, Nature 503:72–7. Cecilia Ljungberg, Yousuf Ali, Jie Zhu, Chia-Shan Wu, Kazuhiro Oka, R.Grace Zhai, Hui-Chen Lu (2012) CREB-activity and nmnat2 transcription are down-regulated prior to neurodegeneration, while NMNAT2 over-expression is neuroprotective, in a mouse model of human tauopathy, Human Mol. Genetics, 15:251-67. Javier Díaz, Tania Aguado, Chia-Shan Wu, Javier Palazuelos, Beat Lutz, Hui-Chen Lu, Manuel Guzmán, Ismael Galve-Roperh (2012) CB1 cannabinoid receptor regulation of Pax-6 and Tbr-2 controls pyramidal neurogenesis and cortical layer specification, Journal of Neuroscience 32: 16651-65. Chia-Shan Wu, Christopher P. Jew, Hui-Chen Lu (2011) Lasting impacts of prenatal cannabis exposure and the role of endogenous cannabinoids in the developing brain, Future Neurology, 6:459-480. Chia-Shan Wu, Carlos J Ballester Rosado, Hui-Chen Lu (2011) What can we learn from BARRELs? - The rodent barrel cortex as a model to study the establishment of neural circuits, European J. Neuroscience, 34:1663-76. YanGang Sun, Chia-Shan Wu, Hui-Chen Lu, Michael Beierlein (2011) Target-dependent control of synaptic inhibition by endocannabinoids in the thalamus, Journal of Neuroscience, 31:9222-30. Carlos J Ballester Rosado, Michael J Albright, Chia-Shan Wu, Chun-Chieh Liao, Jie Zhu, Shen-Ju Chou, Dennis D O’Leary, Li-Jen Lee, and Hui-Chen Lu (2010) mGluR5 in cortical excitatory neurons exerts both cell autonomous and nonautonomous influences on cortical somatosensory circuit formation, Journal of Neuroscience, 30:16896-909. Hsiao-Tuan Chao, Hongmei Chen, Rodney C. Samaco, Mingshan Xue, Maria Chahrour, Jong Yoo, Jeffrey L. Neul, Shiaoching Gong, Hui-Chen Lu, Nathaniel Heintz, Marc Ekker, John L.R. Rubnenstein, Jeffrey L, Noebels, Christian Rosenmund, Huda Y. Zoghbi (2010) GABAergic dysfunction mediates autism-like stereotypies and numerous features of Rett syndrome, Nature, 468(7321):263-9. Chia-Shan Wu, Jie Zhu, Jim Wager-Miller, Shan Wang, Dennis O’Leary, Krisztina Monory, Beat Lutz, Ken Mackie, and Hui-Chen Lu (2010) Requirement of cannabinoid CB1 receptor in cortical pyramidal neurons for appropriate development of corticothalamic and thalamocortical projections, European J. Neuroscience, 32:693-706. Wei-Chi She, Charles Quairiaux, Michael J. Albright, Yu-Chi Wang, Denisse E. Sanchez, Poh-Shing Chang, Egbert Welker, Hui-Chen Lu (2009) Roles of mGluR5 in synaptic function and plasticity of the mouse thalamocortical pathway, European J. Neuroscience, 29: 1379–96 (EJN featured article). Jane E. Lauckner, Jill B. Jensen, Huei-Ying Chen, Hui-Chen Lu, Bertil Hille, and Ken Mackie (2008) GPR55 is a cannabinoid receptor that increases intracellular calcium and inhibits M current, Proc Natl Acad Sci U S A, 105: 2699-04. Jan Mulder, Tania Aguado, Erik Keimpema, Klaudia Barabás, Carlos J. Ballester Rosado, Laurent Nguyen, Krisztina Monory, Giovanni Marsicano, Vincenzo Di Marzo, Yasmin L. Hurd, Francois Guillemo, Ken Mackie, Beat Lutz, Manuel Guzman, Hui-Chen Lu, Ismael Galve-Roperh, Tibor Harkany (2008) Endocannabinoid signaling controls pyramidal cell specification and corticothalamic axon patterning, Proc Natl Acad Sci U S A, 105:8760-765. Hui-Chen Lu, Daniel A Butts, Pascal S. Kaeser, Wei-Chi She, Roger Janz and Michael C. Crair (2006) Role of efficient neurotransmitter release in barrel map development, Journal of Neuroscience, 26: 2692-703. James Carson, Tao Ju, Hui-Chen Lu, Christina Thaller, Mei Xu, Sarah L. Pallas, Joe Warren, Michael C. Crair, Wah Chiu, and Gregor Eichele (2005) A digital atlas to characterize the mouse brain transcriptome, PLoS Comput Bio,1: e41. Hui-Chen Lu, Wei-Chi She, Daniel T. Plas, Paul E. Neumann, Roger Janz, Michael C. Crair (2003) PKA mediated AMPARs trafficking in mouse cortical ‘barrel’ map development, Nature Neuroscience, 6: 939-47. Hui-Chen Lu, Ernesto Gonazlez, and Michael C. Crair (2001) Barrel cortex critical period plasticity is independent of changes in NMDA receptor subunit composition, Neuron, 32: 619-34. You can’t get frustrated by critics or limitations. If you are motivated and like what you do, you will find a way. Growing up in Taiwan in the 1970s, money was scarce in Hui-Chen Lu’s household. Toys were rarely purchased, so Lu made her own, crafting figurines from found objects like paper scraps and cherry pits. Her attention turned to science when, at ten years old, she was tasked with assisting in her grandmother's bookshop. There she discovered a series that captivated her imagination. "Instead of fairy tales, the books that intrigued me were the ones we called 'curiosity books,'" she recalls. "They had titles like, 'Why Does the Rainbow Have Seven Colors?'" With this interest awakened, Lu was delighted when her middle school biology teacher led her students outside to find specimens. "We would chase after butterflies and different kinds of insects," she remembers. Examining their wings, eyes, and bodies, she says, "I began to appreciate the diversity of patterns in the natural world." Although the cultural expectation at the time was for young women to become housewives, Lu was determined to find her own path as a scientist. After completing daily chores of cleaning, laundry, and caring for the family, she would push herself to excel in her academic coursework and prepare for college entrance exams. Her motivation paid off when she was accepted to pursue a degree in zoology at National Taiwan University. In addition to a foundation in molecular and biochemical science, she gained practical experience in the lab, where she learned the key lessons of "failure, frustration, and how to seek help," she says. Unexpectedly, Lu also discovered that her years of housework served her exceptionally well. "To succeed as a scientist, you need to have good hands," she explains. "You need accuracy so you don't destroy things. Doing chores from an early age gave me those fine motor skills." Precision became especially critical when Lu pursued an undergraduate research opportunity working with fruit flies in the Institute of Molecular Biology at Academia Sinica in Taiwan. Although the institute was an hour and a half from her university (by scooter through Taipei traffic), the training she acquired in genetic engineering was so valuable that she decided to stay on as a technician for a year after graduation. The timing proved fortuitous, as the following year the Baylor College of Medicine in Houston offered its first developmental biology PhD program. Lu joined a class of just three initial students, learning about embryonic development by examining fertilized chicken eggs. "I would make a little hole at the top of the egg and cover it with Scotch tape," she describes. "Every couple of hours I would pull back the tape and see what had happened." During her first year in Ph.D. studies as a rotation student under Gregor Eichele, Lu investigated how morphogen gradients and Hox genes control the body's front-to-back and head-to-tail axes. 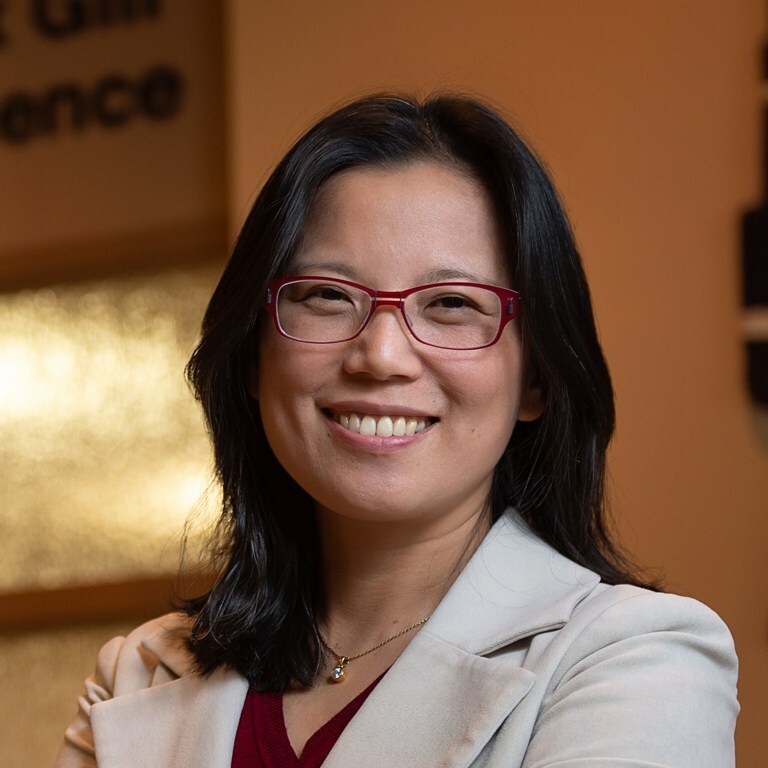 While pregnant with her first child, Lu demonstrated the evolutionary conservation of Hox genes by implanting a chicken gene into a fruit fly in collaboration with IU biologist Thomas Kaufman. Starting a family while in graduate school brought not only practical challenges – there was no nanny budget in her stipend – but also risks related to her perceived career growth. Juggling the demands of work and family required help from friends and colleagues in Houston, yet as Lu explains, "Funding agencies expect you to move to different institutions," she says. "How else can you prove you are gaining new skills and independence?" Drawing on the resourcefulness that served her in childhood, Lu resolved to progress her career while remaining at Baylor. She diversified her training through a postdoc under neuroscientist Michael Crair. As her two sons began reaching developmental milestones, Lu grew increasingly interested in brain development. When she took on an assistant professorship in the same department, objections from traditional funders led her to a bridge grant from the American Heart Association to produce pilot data. This creative approach paid off: the resulting data earned Lu her first NIH grant, which enabled her to become a tenure-track independent investigator. "I had to take a very frugal approach, borrowing equipment from colleagues and collaborating extensively – which in the end made a higher impact," Lu says. Those studies, which used mouse models to examine synaptic transmission, caught the attention of a private foundation with an interest in neurodegeneration. After speaking with their representatives, "I began to see that aging is just the other end of development," she says. Approaching neurodegeneration through the lens of neurodevelopment enabled Lu to ask groundbreaking questions, such as how the body maintains the health of its neuronal networks and how "critical windows" of neuroplasticity are opened at specific points in time. In her subsequent post at Baylor’s Neurological Research Institute, and now at the Gill Center, Lu explores neural circuits over the course of the lifespan, from the effects of different inputs on neural circuit formation to the factors that can increase or prevent neurodegeneration. She is also investigating biomarkers of brain health: Lu's mouse studies indicate that elevated microRNA levels appear in the blood prior to symptoms of numerous ailments including inflammation and Alzheimer's Disease. Summing up her history of defying expectations and turning challenges into advantages, Lu says, "You can’t get frustrated by critics or limitations. If you are motivated and like what you do, you will find a way."